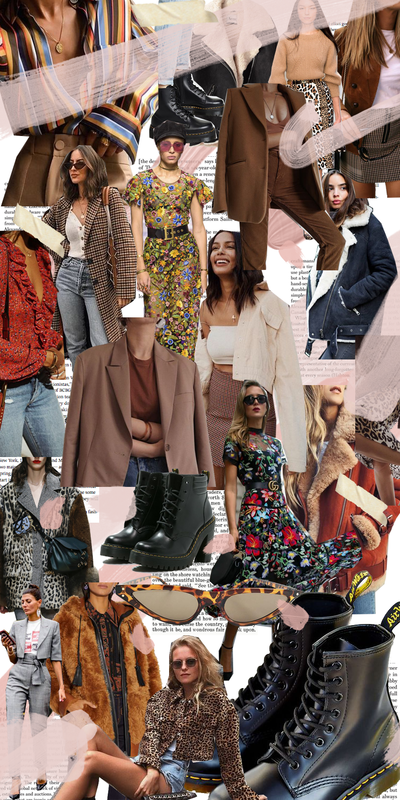 Fall Trends I'm Obsessed With — Posh Mode Ave. I am not big on animal print but I am liking how leopard print is being used this fall. I love the leopard print skirts, jackets, and sunglasses. They look so well, paired with your favorite boots and tee. For me plaid is a year round trend. I love anything plaid. My favorite plaid pieces for the fall are plaid pants, and plaid blazers. They both look good with anything, there are so many ways you can style plaid. Of coarse for fall brown is always popular but I am seeing a lot more brown than usual and I like it. Brown is currently the new black. When you think of floral you think of spring but not this fall. I am loving the floral dresses in particular. Combat boots are always my go to boots in trend or not. So the fact that I am see different types of combat boots in stores, I am in heaven. Shearling jackets are super fashionable and will keep you hella warm. This is hands down my favorite type of jacket to be rockin this fall.